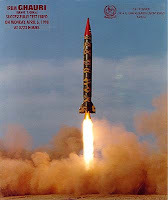 Many well-meaning but misguided Pakistanis, such as Dr. Pervez Hoodbhoy, continue to question the wisdom of Pakistani nuclear tests and subsequent ballistic missiles development in response to India going nuclear in May 1998. As we listen to their arguments, some of which appear quite reasonable and valid, let's try and put them in perspective by reviewing what has become known as India's "Israel envy". "Gung-ho members of India's middle class clamor for Israeli-style retaliation against jihadi training camps in Pakistan. But India can "do a Lebanon" only by risking nuclear war with its neighbor; and Indian intelligence agencies are too inept to imitate Mossad's policy of targeted killings, which have reaped for Israel an endless supply of dedicated and resourceful enemies." The growing admiration of the Jewish state and the urge to emulate Israel often find expression in the Indian media. Those who argue for "doing a Lebanon" in Pakistan have once again found growing support in India with the government and the media joining the chorus of accusations of Pakistan's complicity in Mumbai attacks last year. Saber rattling also started with India's Foreign Minister Pranab Mukherjee not ruling out military strikes in Pakistan. President Obama came out in support of India's right "to protect themselves". Asked if India had the right to “take out” high-value targets inside Pakistan with or without the permission of Islamabad, as he is espousing, he said: “I think that sovereign nations, obviously, have a right to protect themselves". This is the same kind of language that former President Bush often used in support of Israel's attacks on Palestinians and Lebanese. Last year, as the Israeli jets ruthlessly pounded Palestinian civilians' homes, schools, hospitals, clinics and refugee camps, and then the Israeli tanks rolled into Gaza as part of Israel's criminal assault on an unarmed Palestinian civilian population, who do not have their own military to protect them, many Indians openly wished they could do the same in Pakistan. Hamas is in no position to repay Israel's air and ground attacks in kind, whereas an Indian attack on Pakistani territory, even one targeting terrorist bases and training camps, would invite swift retaliation from the Pakistani army. And, at the end of the day, one chilling fact would prevent India from thinking that it could use Israel's playbook: The country that condones, if not foments, the terror attacks on India is a nuclear power. Unfortunately, it is not just the average middle class urban Indian that suffers from "Israel envy". Indian strategists and military brass are also afflicted by it. Respected American South Asia expert Stephen Cohen of Washington's Brookings Institution recently told his audience: "Not a few Indian generals and strategists have told me that if only America would strip Pakistan of its nuclear weapons then the Indian army could destroy the Pakistan army and the whole thing would be over." As we all know, no one came to the rescue of Gazans, or the Lebanese before them, and Israelis have, at least for now, essentially gotten away with mass murder and war crimes well documented by many international human rights advocacy groups. Many Israeli soldiers have also admitted to wanton disregard for civilian life and limb and the use of deadly force against unarmed Arab civilians as a matter of Israeli policy. Recently, Jewish-American Professor William I. Robinson of University of California Santa Barbara described Gaza as follows: "Gaza is Israel's Warsaw -- a vast concentration camp that confined and blockaded Palestinians. We are witness to a slow-motion process of genocide,"
Do the critics of Pakistani nukes such as Hoodbhoy want to see India do to Pakistan what Israel has been doing to its neighbors? I certainly hope not! just shows racial facism element in india's Brahman ruling elites. Indian govts after 1989 where never that strong as the ones that were elected before 1989. Hence they couldnt take decisive action against Pakistan for its blatant sponsoring of jihad against India in Kashmir and elsewhere in India. Looking back we Indians realized how much we missed a leader like Mrs. Indira Gandhi in the 1990s. If she were around probably Pakistan in its present form wouldnt be around. After Pak acquired nukes even conventional advantage India had was nullified but despite that India won the Kargil war initiated by Pak. It is very frustrating for us Indians to see Pakistan get away every time they perpetrate terrorism against India. But then revenge happens in another way. Latest statistics indicate that for every Indian killed by Pakistani terrorists in India, two Pakistanis are killed by terrorists in Pakistan. Whether these terrorists are Indian trained or not I dont know but surely this is called justice by many. India is waiting for Pakistan to commit that one crucial blunder of pressing the nuke button first. Rest assured that will wipe out Pakistan from the world forever. Yes India will be affected somewhat but the long term dividend for India and the rest of the world will be priceless. Hoodbhoy is only wrong is the apportioning of blame for the failing state of Pakistan. The state, in it's current avatar, will rip itself apart with or without the bomb. Also with or without outside "assistance". When Jinnah did his little bait and switch - Islamic Republic ... err no Secular Homeland for Muslims - he laid the foundation for the chaos being witnessed today. Why grudge the mullahs their little emirates now? At least they're honest and consistent about what they wanted all along. Not so the duplicitous "elite" of Pakistan starting with the now-canonized can-do-no-wrong Quaid. So, yes, India unfortunately has to deal with a psycho neighbor with a nuclear gun. But that psycho neighbor - while protecting and burnishing that nuclear gun, and chest-thumping all the while - is having its own body eaten inside out from a congenital cancer. Eternal laws has its own way of giving it back beyond ordinary intelligence of human being. "Latest statistics indicate that for every Indian killed by Pakistani terrorists in India, two Pakistanis are killed by terrorists in Pakistan." The worst curse for pakistan is the self destruction from the monester trained by them few decades back at the behest of its master usa which is now screwing its hell out of pakistan. I met Pervez Hoodbhoy in 2001/02 while I was a grad student at Geroge Washington University in DC. It was a seminar hosted by a student organization on S Asia. To my horror, I couldn't believe what this guy was talking about. First he showed his poorly made "Bollywood" flick, a cut n paste job which showed how much we need to avoid a nuclear Pakistan and then he continuously opposed any Nuclear energy or weapons for Pakistan. Let's leave the patriotism out of my comments, but if you use your brain, history tells us, When China tested it's Nuclear Weapon, it was awarded a permanent seat at the security council. No one raised any RED flags when India tested it's weapon. Israel, well, lets not even go there, after all we "muslims" are not the chosen people of God.And we dont run the US Govt. Mr Hoodbhoy is a dispicable character, he seemed arrogant, unintelligent and quite anti muslim. I got no beef with his freedom of speech, and freedom of his belief. But For Gods's sake man, are you that dumb ? With nuclear energy, there is so much more than just an atomic weapon. Terrorism today, is not because of fundamentalists but a lack of leadership and virtually non existence of human rights. these people are fighting for what our fore fathers fought for, Freedom, and a land for muslims. Look at the poor villagers who are breeding blue collar workers for the white collar elite, who make sure they never get out of their hoods. Who is joining Taliban, it's the poor folk's, thats the only way out they see. Hoodbhoy, as much as I believe is an anti Pakistani, uses is western education, to destroy pakistan rather than build it. Pakistan is not a third world country because it's poor, its the lack of ability to produce genuine leaders like Omar, Osman, Abu bakr that leaves us behind the developed world. "Who is joining Taliban, it's the poor folk's, thats the only way out they see." Well Saudis who carried out 9/11 werent poor nor are the people who fund Taliban..How come Taliban gets to pay its soldiers double than Afgan army or Pak army?.. About Pak's right about nuclear weapons and blah blah..
How does that sounds to a donar? I agree that certain western educated people tends to be over critical about their motherland due to their expectation of higher values / standards. Even india has got people like arundati roy, who does not have much following and people generally ignore or abuse. In my perception, it does not matter. if those criticism has got some lesson which we can learn to correct ourself for better i think every body must do it rather than screaming at them. Touch your heart and see yourself the state of pakistan after 62 years of independence. Further this reminds of the story of the zen master who asked his student to empty all his thoughts to learn news. If a country or a person feels that he has got everything right then the chances of the that person growth could be nearing zero. in fact some amount of insufficiency is the driver for growth and maturity. Only poor take to Taliban???? Is that so? The Pakistanis in England bombings are NOT poor. Recently caught pakistanis AGAIN for terrorist attack plans are NOT poor.The pakistan who killed jews in US in temple near seattle is not poor.Riaz as I said many times -pakistans pathetic situation is not because of POOR but because of hypocrisy and religious preudices of its rich and middle class. They do not deserve any mercy! Either way Pakistan is done as nation-yes few more troubles for India here and there and thats it.US is in its troubles and significantly no one is left to give funds to pakistan to survive too long. When you a dig that deep in dirty waters of religious hatred on jews and hindus and christians-any nation will perish. Your concern of the radical wing in India is surprising given the fact that an equal or more number of fanatics thrive in Pakistan. Of course, I don't need to tell you that. Hussain Haqqani, in his book, has explicitly written about the military-mullah complex which dominates the power structure in Pakistan and the scathing hatred they carry against India and kafirs. Two wrongs do not make it right. The number of reasonable people in India exceed those who share more radical views regarding their notorious neighbors. Now, about nukes. No country, except Pakistan, wears the nukes on its sleeves and threatens to use them at a drop of a hat. This behavior is similar to that of a child who discovered a loaded pistol and now feels free to threaten anyone in return for some candy. Contrary to your view, the nukes in Pakistan protect the military-jihadi complex and not the state. The nuke proliferation from Pakistan proves this point. Anonymous: You say my "concern of the radical wing in India is surprising given the fact that an equal or more number of fanatics thrive in Pakistan." My concern is based on my experience...whether any radio or tv shows or the Internet boards, I see the right-wing urban middle class well-fed Indians with a little bit of money in their pockets constantly threatening Pakistan whenever any terrorist attacks happen in India. I have never seen regular Pakistanis threaten India in this way, eve when they suspect India's involvement in bombings in Pakistan. It was only after a lot of saber rattling by Indians after Mumbai that Pakistan's Gen Kiyani responded with the threat of swift retaliation if India engaged in any misadventure against Pakistan. Pakistani media, people and officials show a lot more restraint than their Indian counterparts. You said, "I see the right-wing urban middle class well-fed Indians with a little bit of money in their pockets constantly threatening Pakistan whenever any terrorist attacks happen in India." - It's a natural response given the fact that almost every terror trail leads to Pakistan. Indians are not alone when they say it. Ask, the Filipinos, the British, the Iranians, the Chinese, the Nepalis or the Bangladeshis. Any terrorist attack or a terror plot, when uncovered, often traced back to the land of the pure. Ironically, the sabre-rattling angers you but you are blind to the state-sponsored terrorism in your country. You said "Pakistani media, people and officials show a lot more restraint than their Indian counterparts." - That's not true. I'd like to make couple of points. Firstly, they may not because the suspicions are not supported by enough evidence. There are allegations and conspiracy theories. Thats it. Turns out the lahore attacks on Sri Lankan team were carried out by Pakistanis, not Indians, as confidently suggested in the Pak experts on the eve of the attacks. Secondly, despite lack of evidence, Pakistani middle-class does enough sabre rattling on their on numerous TV channels. The videos are all over the internet to see. It makes absolutely no sense to threaten an entire country even if some of its nationals may be involved in an act of terrorism. Nor does such a strategy work. That's what my post points out amply. Besides, many of the high-profile terror allegations on Pakistanis have not stood up top the scrutiny of due process in court after serious allegations and arrests were made....such as recently in Britain. So, allegations themselves are not substitute for proof. Pakistan is itself a victim of terror by people who cam from elsewhere or were inspired from outside Pakistan. Neither al Qaeda nor Taliban orgs are originally from Pakistan, though both have succeeded recruiting from Pakistan. Pakistani military is currently fighting these groups and people like you continue to make false allegations about their implication in terror. It is just ridiculous. You should look for causes of terror in the injustices and inequalities in your nation or in occupied Kashmir rather than blame others. From what we know, there are different terrorist groups for different purposes in Pakistan. The Pak army chose to fight the Taliban as a consequence of an outrage from the West and the carrot and stick policy followed by the US. However, the terror groups, such as LeT, JuD, HuM etc, in southern Punjab continue to thrive to foment trouble on the eastern border of Pakistan. This has been the sore point in the Indo-Pak composite dialog. Here's an interesting call-in discussion on NOR Talk of the Nation about Mumbai with NY Times reporter Somini Sengupta. Here's an interesting call-in discussion on NPR Talk of the Nation about Mumbai with NY Times reporter Somini Sengupta. I had heard of India’s “Israel Envy”, a phrase coined by former Indian minister Sashi Tharoor. I guess the gung-ho Indians like this Indian blogger are now suffering from India’s “America Envy”. Israel today said it's official India Facebook page has the most 'Likes' after that of the US and the United Kindgom. The ISRAEL in INDIA Facebook page, launched by the Israelian Embassy in August, 2010, has received almost 20,000 'likes', a figure surpassed only by the pages of the US and the UK. Two decades after India and Israel established full diplomatic relations, ties between the two nations are extending far beyond traditional diplomacy, the Embassy said in a statement. Less than two years after the Israeli Embassy in New Delhi launched its activity on Facebook, Twitter, Youtube and other virtual platforms, Israel managed to gain “exceptional popularity” in the Indian social media arena, it said. The Embassy also launched a new website recently, which provides frequent updates on Israeli activities in India as well as a fresh and young look at Israel's society, history, culture and economy. The Embassy also operates specialised websites in Hindi and Urdu. “These results are impressive”, said Alon Ushpiz, Israel's Ambassador to India. “They mirror the warmth and friendship that we Israelis feel across India and they are yet another indication of the immense potential that lies in our relationship”, he added. Why quote a gora dalrymple? Anon: "why quote a gora?" Was your guruji Golwalkar gora? Was he not an admirer of gora Hitler and white supremacists? “To keep up the purity of the Race and its culture, Germany shocked the world by her purging of its Semitic Race, the Jews." From your posts, it is very obvious that you are obsessed about indians and hindus in particular. What happens in India is their own internal issue? So why worry about it. Rather people like you could be focussing on making pakistan an economically developed country. But that is not to happen. Without India, pakistanis have no identity of their own, so they have to fuss about what happens in India. If India appoints Narendra Modi, what is your issue? If you are really concerned about muslims in India you should invite them to migrate to pakistan and live there. BK: " it is very obvious that you are obsessed about indians and hindus in particular. What happens in India is their own internal issue? So why worry about it." The fact that, unlike Pakistanis on Indian websites, you and your fellow Indians show up in large numbers to comment on Pakistani websites shows that you are far more obsessed with Pakistan...even some of your Indian leaders admit that Indians are obsessed with Pakistan...."I actually feel we give too much time in our minds to Pakistan," said Rahul Gandhi at a leadership meeting of the Indian National Congress in 2009. As to this post you are commenting it, I suggest you read it again to comprehend it. It deals with the negative impact of India's Israel envy on Pakistan. A very informative read indeed on Indo-Pak relations. I had to spend a lot of time reading the article and whole comments section but it was worth every second. Thank you very much Mr Riaz. Bless you!